Traveling, from the fast paced lifestyle of London to the laid-back ways of Amsterdam, was a complete breath of fresh air. The city, although bustling with tourists, had a beautiful calm to it that stretched long throughout the days.After my amazing experience in London I felt it would only make sense to stay once again with CitizenM and check it out for myself! Since learning that CitizenM originated in Amsterdam, with their first hotel located at Amsterdam Schiphol Airport in 2008 followed by their second hotel which opened in 2009, residing 15 minutes away from Amsterdam's city centre, I saw that one next! When I arrived it felt like home more than I'd expected and was welcomingly mixed with the familiar sense that I’ve been here before. After staying at the CitizenM: Tower of London just a short week prior, I had become accustomed to the “good life”. Spoiled by iPad controlled mood lights, comfy king sized beds, and the impressively kind staff. I officially became too comfortable. Like that roommate you let drink your milk one time.. to find that months later you have been supporting them and the term ‘help yourself’ was taken way out of context. Yep! that was me with CitizenM and I loved every minute of it. This Netherlands-based hotel chain, prides themselves on and actually provokes the sense of easy comfortability. 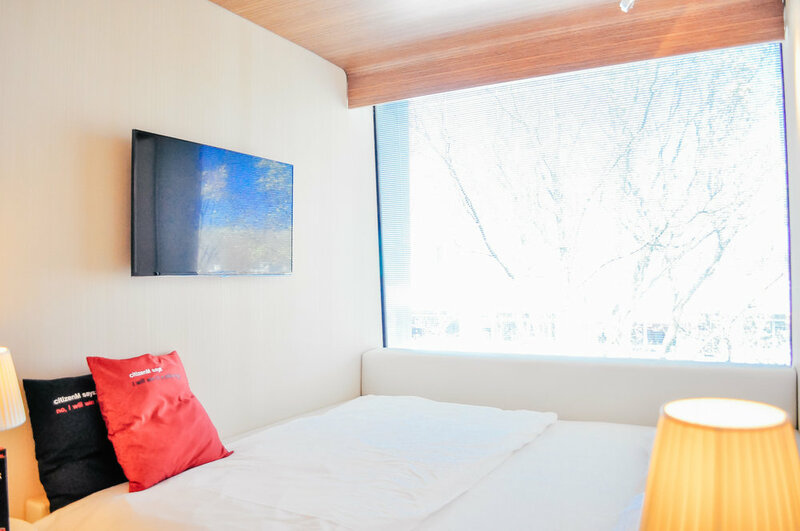 Following the motto: “always stay in a hotel as nice as your home (unless you live in a tent)”, CitizenM has cunningly designed their bedrooms for sleeping, along with their lobby and canteens to mimic your at home living room and kitchens. Featuring three swanky divided living room designs and communal tables for dining, it was a no brainer when CitizenM: Amsterdam was awarded a Fodor’s 100 Hotel award for Design in 2011. From the moment I walked through the doors, I was greeted with huge smiles from the staff. Amazed that although I was in another country, CitizenM has seamlessly maintained the same exceptional services throughout my stay as previously provided in London. Aside from the Amsterdam Hotel being a couple years older than their London location, I found nothing compromised in terms of style. For a concept designed in 2009, this hotel was truly ahead of its time. With a heavy focus on communal spaces for connecting people together, I found this set the mood for a professional yet laid back environment. Providing guests the ability to easily get some work done or kick-back and relax. My favourite part by far at CitizenM: Amsterdam was that each hotel room bathroom provided a fun and futuristic design consisting of transparent sliding glass pods with a rain shower head above (see-through showers get me every time). Closer to the evening of our stay, my friend Alice and I were getting ready to head out for a night cruise on the famous canals. With the tram literally steps away from the hotel and the train less than a 10 minute walk, its location made our trip to and from Central Station a breeze. The next morning Alice was to fly back to London and from the previous day she knew I had my heart set on the chance for us to end our trip with a picture in front of the I Amsterdam sign (without the crowds of people bombarding it). Sometimes I think she is too good of a friend because although we went to sleep very late after the canals (3am). She supported my dedication to waking up at 7am the next morning to enjoy our last European CitizenM breakfast together and parade over to the sign and claim our prize. Despite the fact she supported my so called “dedication”, the reality was I didn't want to wake up at 7am and neither did she… especially with barely any sleep. If it wasn't for CitizenM’s in-room alarm we would of slept right through and missed the perfect photo. It was at 6:45 am that our alarm went off, however this alarm was not like anything i've experienced before. All the lights in the room gently turned on, the blinds rose and the sunlight shone in as the sounds of a tennis ball bouncing off a court came through the tv (or what I thought sounded like a tennis ball). Even though I was a complete zombie from lack of sleep, we never would’ve woken up in time or had the experience we did if it wasn't for the intricate details (and 5 espresso’s) CitizenM put into their hotel features. Overall I found it a unique opportunity to be able to stay at both CitizenM’s Tower of London and Amsterdam locations, especially from an entrepreneur point of view. I not only saw how the company had grown over the years, but I got to experience first hand how their values have stayed true to their brand and customers throughout this time. 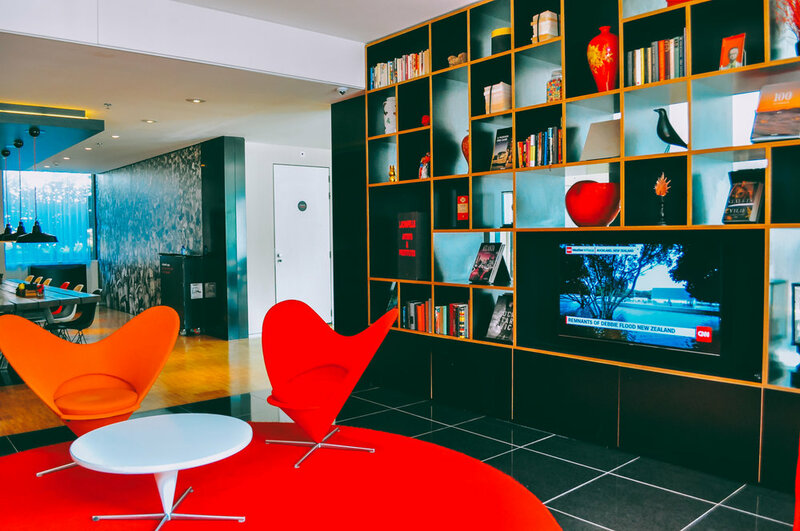 I can honestly say CitizenM is a concept I am proud to stand behind and would recommend to any modern-day traveller. I cannot wait to stay again. Travelling to London or Amsterdam soon? Read all about my stay at CitizenM: Tower of London here. With locations in London, Amsterdam, Rotterdam, Glasgow, Paris and New York City. Book your stay now & experience it for yourself here!